In October 1914, Mary, Princess Royal, the 17 year-old daughter of King George V. launched an appeal to fund every member of the armed forces receiving a Christmas gift. Funding was used to manufacture small boxes made of silver for officers and brass for all others. 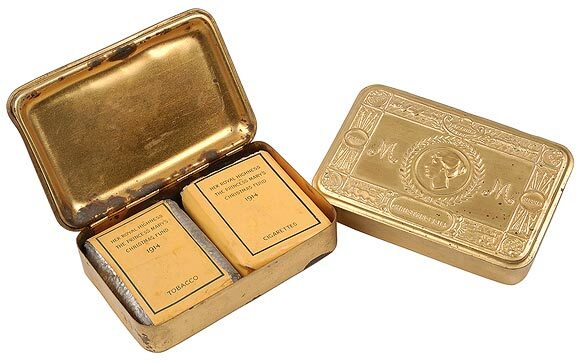 Each was decorated with an image of Mary and other military and imperial symbols and typically filled with an ounce of tobacco, a packet of cigarettes in a yellow monogrammed wrapper, a cigarette lighter, and a Christmas card and photograph from Princess Mary.